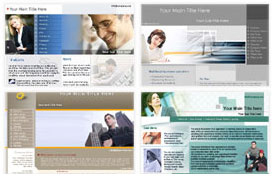 Your choice from a group of designs featuring different styles, color schemes, and layouts. Our customization of your design to meet your needs (advanced edit may be required). Assistance in writing your website copy. Assitance in gathering your photos and/or selecting from suggested royalty free stock photography. Features such as self management tools, photo galleries, product catalogs, online sales, custom forms, and others can be included at your request. Our design of your complete website, made available on the web for your review. Our corrections to the draft copy of your site as per your request. Upon approval, our provision of website hosting, email accounts, and access to your website's statistics. At your request, occasional or continued website maintenance in a timely, accurate, and affordable manner.